Donald Duck's escapades and a fiery temperament have ensured seventy riotous years in the spotlight, which are being marked around the world on Wednesday. From his humble beginnings in Wise Little Hen - wearing his now-famous sailor suit and hat - he went on to win an Oscar, star in five feature films, and play a major part in the war effort during the 1940s. But the secret to his longevity lies in his distinctive - but unintelligible - command of language and his good intentions in a world that is trying to keep him down. Jeff Archambault, vice-president of marketing at Disneyland Paris said: "I think his secret is this eternal youth and this mischievous quality. "Of all the Disney characters he is the one who demonstrates the most truly human qualities, he can be humorous, very mischievous but sometimes he is just having a very bad day." Donald first found love in 1937 in the exotic Don Donald where he met the tempestuous Donna Duck - she later became better known as Daisy Duck. Huey, Dewey and Louie - Donald's naughty nephews - made their debut in 1938 in the short film Donald's Nephews, and have continued to drive their uncle to despair. But Donald's exploits have not always been so charmingly naive. He was drafted into the US army during World War II, where he played a huge part in getting people to pay their income tax to support the war effort. His image also appeared on planes, tanks, jeeps and uniforms. Donald also entered politics during the war years in a number of satirically punctuated films, one of which - Der Fuehrer's Face - won an Oscar in 1943 for the best short film. In the film, Donald has a nightmare he is living in Nazi Germany, working hard on the munitions assembly line, suffering from starvation and envisioning bayonet discipline. But when he wakes up and finds himself in the shadow of the Statue of Liberty he celebrates the fact he is a US citizen. 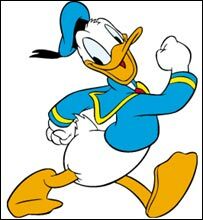 Voiced originally by Clarence "Ducky" Nash, who was succeeded after 50 years by Tony Anselmo, Donald has appeared in over 200 productions. He is the only Disney animal character to appear in five full-length feature films, the latest of which will be released later this year. In The Three Musketeers, Donald teams up with his old friends Mickey and Goofy on an action-packed adventure where the trio get the chance to become true musketeers by protecting princess Mimmi.